No jockey has ever dominated thoroughbred racing quite like Isaac Murphy in the 1880s. The nation’s first African-American sports superstar earned between $10,000 and $25,000 a year and regularly won half or more of the races he entered. As Murphy closed in on age 30, nagging illnesses and a battle with his weight triggered whispers among fans and owners that he might soon be through. Much of his troubles were actually due to crash dieting, which was basically starvation in Murphy's case. 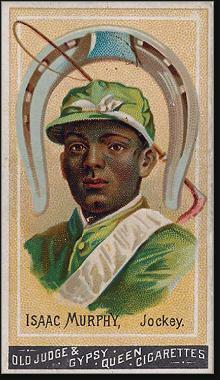 On August 26, 1890, Murphy’s career took a turn for the worse during the Monmouth Handicap. Dizzy from lack of food and water, he slid off his mount, Firenze. Track officials immediately suspended him for being drunk, despite the fact there were credible witnesses to his sobriety immediately before the race. The damage, however, was done. The New York Times reported that “a popular idol was shattered at Monmouth Park yesterday. That Isaac Murphy, who has always been considered the most gentlemanly as well as the most honest of jockeys, would have made such an exhibition of himself as he did was past belief. He rode Firenze in the Monmouth Handicap, and that he did so was alone the reason for the ridiculous way in which she was beaten, finishing last in a field of horses that she should have defeated with but little trouble." Murphy still had some gas in the tank. In 1891, he rode Kingsman to victory in the Kentucky Derby—the one and only time the race was won by a horse owned by an African-American. In the years that followed, however, his career waned. Murphy reportedly never got over the accusations made against him at Monmouth Park that day.